Moving seemed more daunting this time. as did a few friends when they could. Honestly, moving can bring out the true character of people! Fred, Nick, and TJ did an amazing amount of grunt work! I must of had close to 75 boxes of just books (not to mention bookcases that held them all). We are all tired, exhausted even, as we cleaned both the home we moved into as well as the home we were moving out of in the midst of hauling all our stuff load by load. I am pretty proud of my boys! because it took much longer to get settled this time. it has been a week and I am still not done. Chanelle stayed up til wee hours of the night last week helping me unpack. Of course we are still having fun in the process! After all, have you heard? The Seahawks made it through the play offs! Yep, they are Superbowl bound. So we packed, and moved in between game plays. 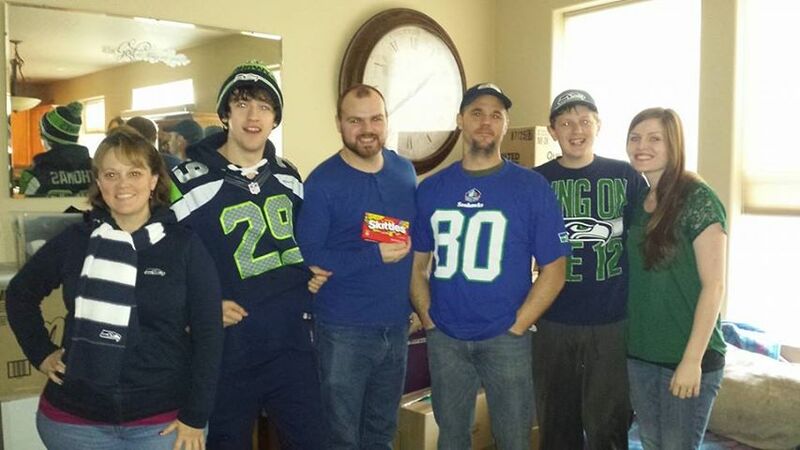 Got our house unpacked just in time to watch our ‘hawks win the NFC championship. So now my goal is to get our house in complete order. I am excited about our new home in the woods. our new surroundings, and giving you a tour of our humble place in the world.